Bakery Label For Monarch Gun White with Purple Stripe - 0.75 in. x 0.63 in. 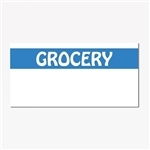 These meat and produce labels help you manage your store foods more effectively.